A rare 1919-D half dollar PCGS MS65 is among the stellar offerings valued at more than $3 million in Legend-Morphy’s Dec. 13 Regency Auction at the PCGS Members Only Coin Show. 1919-D half dollar PCGS MS65, the first 1919-D to appear at auction in six years. Estimate $200,000-$225,000. Legend-Morphy Auctions image. More than 320 lots of primarily PCGS-graded US coins will cross the block in an elegantly low-key environment held at The Cosmopolitan™ of Las Vegas, Dec. 13. 1856 FE PCGS PR65 S-9 CAC Photo Seal 1-cent, super high-end quality with impeccable across-the-board credentials, fewer than 1,000 minted. Estimate: $32,500-$35,000. Legend-Morphy Auctions image. "For our initial outing as the official auctioneer for the PCGS Members Only Show, we’ve taken a connoisseur’s approach, which favors quality over quantity," said Legend-Morphy co-owner Laura Sperber. "We’ve refined the selection for this auction using very strict guidelines, and as a result, each coin that made the final cut is a truly superb example." The featured highlight is a 1919-D half dollar PCGS MS65, boasting surfaces as clean and boldly lustrous as what one might find on a common-date MS66. With very crisply struck details, including the full split on Miss Liberty’s thumb so clear it is visible to the naked eye, this coin is the first 1919-D to appear at auction in six years. In 2006, a comparable coin sold for $172,500. With its combination of unbelievable condition and terrific eye appeal, the example in Legend-Morphy’s Las Vegas sale is expected to command $200,000-$225,000. 1896 PCGS PR66+ DCAM CAC $10, finest graded at PCGS and NGC for a DCAM, fresh from Far East Eagle Collection, first appearance at auction. Estimate $95,000-$105,000. Legend-Morphy Auctions image. Dan Morphy, co-owner of Legend-Morphy Rare Coin Auctions, said he expects collectors to respond enthusiastically to the boutique concept he, Laura Sperber and company president Julie Abrams have developed for their Regency Auction premiere. 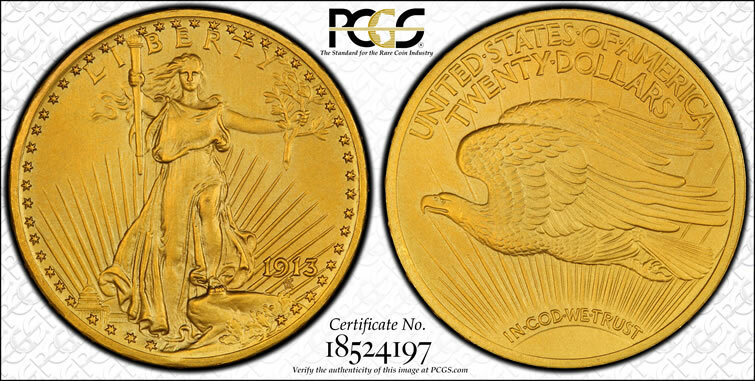 1913 PCGS PR66 CAC $20 matte proof, intensely original, one of 58 minted, one of three PCGS graded, from Far East Eagle Collection. Estimate $95,000-$105,000. Legend-Morphy Auctions image. "Serious collectors and numismatic investors like to take their time when inspecting coins. 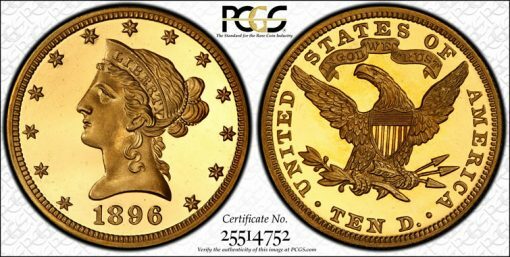 We will provide an unhurried, no-pressure environment in which to view the stellar selection of coins in our first auction held in conjunction with the PCGS Members Only Coin Show," Morphy said. "I also think collectors are going to appreciate the extra effort we’ve made to ensure every coin in our December 13 sale is a winner — you won’t find better odds anywhere in Las Vegas." The Thursday, Dec. 13 Regency Auction at the PCGS Members Only Show will commence at 6 p.m. Pacific Time in the Gracia #1 Room. Additional bidding methods include absentee, by phone and absentee/live via the Internet through the Legend-Morphy website (www.legendmorphy.com). The Cosmopolitan of Las Vegas is located at 3708 Las Vegas Blvd. South, Las Vegas, NV 89109. Preview all coins on Wednesday, Dec. 12 from 11 a.m.-6 p.m. and Thursday, Dec. 13 from 8 a.m.-5 p.m., in The Cosmopolitan’s Condesa #3-4 Rooms.